on May 15. But music fans will also have plenty to celebrate on that date thanks to a superstar collaboration slated for the movie's soundtrack. According to E! Online, Beyoncé has hooked up with Andre 3000 for a cover of late British singer Amy Winehouse's "Back to Black" for the movie's soundtrack album. 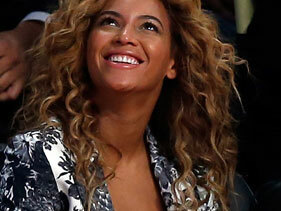 It should come as no surprise that Bey is on the disc, since husband Jay-Z is producing it. "It's a very different take on 'Back to Black,'" an unnamed source at Interscope Records told the site about the pair's take on the dark title track to Winehouse's Grammy-winning final studio effort during her lifetime. It will be the second collabo between Andre and Beyonce, following Three Stack's verse on the song "Party" from Bey's 4 album. Little else is known about the soundtrack, though Jay is expected to contribute some music to it as well. Hova's Watch the Throne hit "No Church in the Wild"
appeared in the trailer for the film, as did Jack White's cover of U2's "Love is Blindness." Though the movie is based on the literary classic that takes place in the 1920's, director Luhrmann has long made a point of mixing modern music with classic tales. In 1996's "Romeo + Juliet" he featured music from Radiohead and 2001's "Moulin Rouge," spawned the Christina Aguilera hit cover of "Lady Marmalade." "Gatsby" was originally slated to hit theaters during the 2012 holiday season, but was delayed so Luhrmann could complete work on the flick, which stars Leonardo DiCaprio as F. Scott Fitzgerald's literary icon Jay Gatsby. It also stars Carey Mulligan in the pivotal role of Gatsby's lost love, Daisy, as well as Tobey Maguire, Joel Edgerton, Isla Fisher and Jason Clarke.